I always wondered how it was to try to walk and type at the same time. I used to have trouble playing the clarinet and marching at the same time in marching band. . .:) Good for your hubby. I am like Becky and try to either fit exercise in with my dog or ride my bike with my daughter. But you are right, exercise does give you more energy! I know several people who walk and type with no problem. I'm going to try it again at a slower speed. Like Margo, walking and whatever can be tricky when when it involves music. I'm in my church choir. I can walk and process while singing to some hymns, not others but it is all about rhythm. Now, if you'll excuse me, I'm going to get a bit done around here and then go use my treadmill desk! Would not work for me. I'd eventually forget I needed to keep walking just long enough to find myself on the floor. In pain. 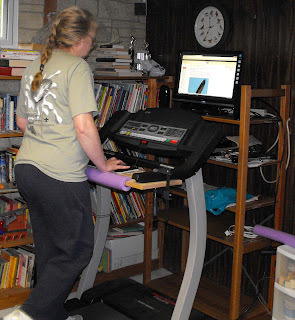 I would really like something like this - and I would use it faithfully - but when you live in the middle of the country, in the middle of nowhere, the husband doesn't understand the need for a treadmill when I have 7 sections of land to walk on/around. HA! I tried one of these years ago when Annette's husband built her one. It's SO trippy! I don't know how you get anything done on it, but I guess you get used to it. My hubby said one of his friends at work has a treadmill that's less than a year old and wants to trade it for product at his shop, so I think I'll be getting one soon! :) SueBE, how did your hubby build it? Are there instructions online somewhere? I'm thinking of going with the exercise bike version...maybe I could handle pedaling and typing at the same time. But walking and typing? Not a chance. A lot of the reason my husband okay'ed this was our summer weather. We worked one swim meet this year where the temperature on deck was 122 degrees. Not sure what the "real" temp was but who cares when it gets that high. He looked at things online but then did it his own way. I'll bug him for details! What a fabulous way to get your exercise in and keep the oxygen flowing to the brain so the words flow on to the page! I've blogged about standing and writing on my blog, The Literary Leotard, www.lindarosen.blogspot.com I'd love to link this post to my blog -- it's a perfect fit. Any interest?